The Margaret River region is a paradise for food lovers, with a gentle Mediterranean climate, fertile soil and hospitable terrain that produce 20 percent of Australia’s premium wines, freshly pressed extra virgin olive oil, and a tantalising array of locally and organically grown produce, venison, cheese, yoghurts, meats and other culinary delights. Anything delicious that comes out of the earth can be found in Margaret River. Margaret River venison: The Margaret River Venison farm shop on Caves Road sells an assortment of venison products, including sausage, steaks, kebabs and other meat products made from farm-raised deer. Samples and shipping are available. And if you’d like to try Kangaroo or Emu meat, those “only in Australia” products are sold here as well. Margaret River farm shop: If you want to taste some of Australia’s best pork, lamb and other farm-fresh foods, try the McHenry Hohnen Farm Shop, where you can also buy wines from this highly respected local vintner. A Margaret River farm shop is the ideal place to sample a variety of the culinary bounty of our region. Margaret River Farmers Market: There’s no better way to have your pick of fresh local produce, food and farm products than by attending a Margaret River Farmers Market. Every 2nd and 4th Saturday during summer months (and every 4th Saturday in winter) from 8 a.m. to 12 p.m., the Margaret River Farmers Market is open for business with local farmers and wine makers manning their stalls and selling directly to customers. There is also an independent farmers market in Vasse on the 3rd Saturday of each month. Locally Grown Nuts and Cereals: If you’re looking for something to accompany a pint of beer or cleanse the palate between wineries, the Margaret River region produces an assortment of delicious nuts and cereals that can accommodate you. 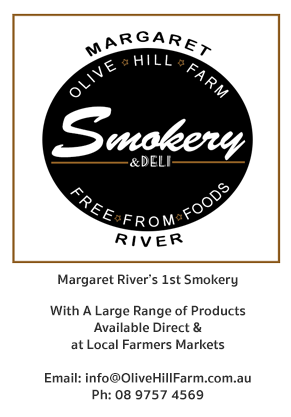 Margaret River Gourmet Delights: Margaret Riviera, this gourmet food shop celebrates all the good food of our local region – if you want a “one stop shop” to sample the best foods of Margaret River, this is your ideal destination. Margaret River Hampers: Margaret River Hampers has a range of gourmet hampers showcasing some of Margaret River’s finest produce. These hampers are hand picked exclusively to ensure the highest quality gourmet food and wines including cold chilled products . If you want to Experience the Best of Margaret River food, wine and fine dining, let us help you find your next taste sensation. We have selected the “Best” of each category of attractions, and all of these businesses meet the exacting standards of our local expert. Our guide can also help you find the best restaurants, winery tours, shopping, art galleries, nature hiking, accommodation, outdoor activities, and much more. Yes we have some great cheeses made locally: Brie, Camembert, Club Cheddars, Fetas and Baked Ricotta all at the Margaret River Cheese Company. If you make it on a Margaret River Farmers Market weekend you will also have the chance for some amazing Sheep cheese from Cambray Sheep Cheese in Nannup. What kinds of cheeses do you have? anything unique?